With the votes rolling-in for DJ Mag’s annual Top 100 DJs in their thousands — we’re really excited to announce the first phase line-up for our huge Top 100 DJs party at London’s Brixton Academy on Saturday 22nd October. Confirmed to play — in what is the biggest indoor celebration of dance music in the UK — will be Ferry Corsten: Presenting Gouryella, Markus Schulz and Marlo. 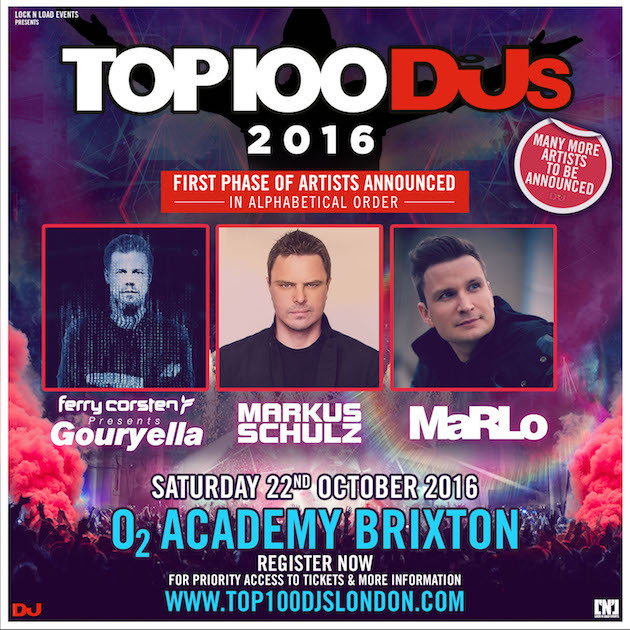 Ferry Corsten has featured in the Top 100 DJs since its inception and although he’s one of the few top Dutch DJs to never have actually won the prized accolade, he’ll be bringing his Gouryella moniker to London for a rare show. Alongside Corsten, we’re excited to reveal Markus Schulz. This German-American DJ has been at the forefront of trance for well over a decade and used to perform alongside Corsten as trance supergroup New World Punx. Last but not least, we’re really excited to reveal that Dutch-born, Australian-raised DJ and producer Marlo who will be joining the bill for a trifecta Dutch trance gods. Make sure to ​sign up for priority access to tickets to be a part of what will be a memorable night.